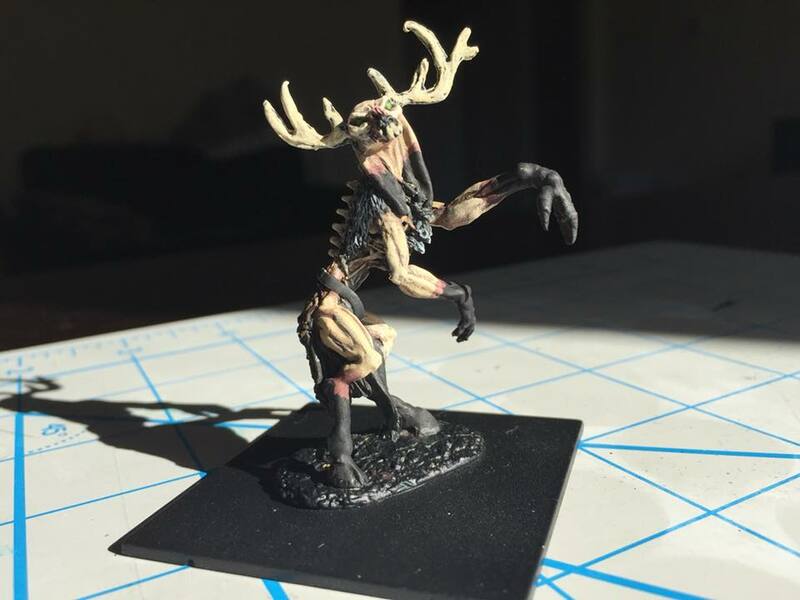 Last year as part of the Secret Santa exchange, I received (alongside several packs of skeletons) a metal Wendigo figure from Reaper Miniatures, courtesy of Thomas over at Learning by Doing. 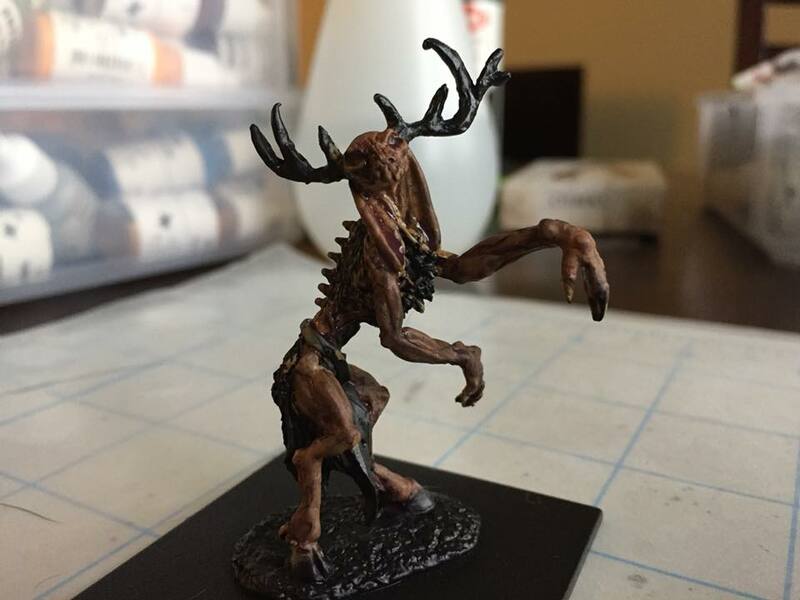 This is a really gorgeously ghoulish figure, gaunt, with long limbs, hooved feet, a skeletal face and antlers. A perfect representation of the cannibalistic "spirit of the lonely places" of Algonquin folklore, a creature born of famine, isolation and desperation in the deep winters of the American wilderness. I'd gotten it cleaned up and glued to a 50mm square base (a spare from a Fireforge cavalry boxed set) but hadn't gotten past that point. Yesterday, frustrated with some Bones figures not behaving the way I wanted them to, I resupplied on black primer and matte varnish and took advantage of it being a warm, dry day to put a coat of primer on him. Once it was good and dry I got to work. Once that was dry, I highlighted the skin with Golden Skin, then again with Golden Highlight. The bony ridges of the face, the exposed vertebrae and some exposed ribs got a final highlight of a mix of Golden Highlight and Creamy Ivory - to suggest skin drawn so tightly over bones as to be translucent. The hands, feet, ears and area around the mouth were given another wash, this time a 30-60 mix of Nightshade Purple and Deep Red to prepare these extremities to be painted as frostbitten. Once the wash was dry, a couple thin coats of Pure Black allowed just enough purple to show through to keep things interesting. Also, don't Google Image Search "frostbitten hands" too soon before or after a meal! After taking that pic, I basecoated the "leather" areas of the loincloth with Lonestar Leather, but when I tried highlighting with Leather Brown, Leather Brown went on very thinly and I ended up having to go over the entirety of the loincloth with it to get an evenish coat. I'll probably go back and wash it with Lonestar Leather and give a final highlight of Golden Shadow to the loincloth. Eyes were highlighted with Moth Green, giving them a sinister, glowing pinprick in the center of each bulging orb and marking my only departure from very naturalistic tones on this figure. At this point, Atticus decided to jump in the middle of everything and tell me I'd done enough painting and not enough petting today, forcing a conclusion to today's painting session. I've got a couple extra Bones skeleton warriors that I'll be chopping up, painting and gluing to the base during the flocking process to represent kills half-buried in the snow by the Wendigo. While the Wendigo would make a spiffy Major Demon for Frostgrave, I'm actually thinking he's more likely to see use in Dragon Rampant; having finished my Undead army and wanting a break from Bones given the annoyance I'm having with the last of my Anhurian figures, I've drawn up a "Warriors of Evil" list based largely around Ral Partha Chaos Warrior figures (rereleased through Ironwind Metals) as a "next project" to begin work on, and the Wendigo would be an imposing addition to that list as a "Greater Warbeast." What a great figure, really creepy but nicely painted. Thank you Michael! I hope it's even creepier and more impressive when it's done!